Put your confidence in a service in Crayford with a customer rating of over 96%! A: The adepts will rinse your windows with risk-free water-fed pole gear or use reliable ropes and cherry pickers to clean high-rise buildings. We also offer interior window cleaning in Crayford, done with the standard ladders and squeegees. A: This useful allows the Crayford window cleaners to treat any skylight, sash window, French door, and other pane types on any four-storey home or office. Q: Why don't you wipe off the residual water once your work is done? A: It's simple – we won't rinse your windows with normal tap water. Instead, the adepts will remove the dust build-ups with filtered water that won't mar your panes once it evaporates. Q: Do I need to prepare beforehand for the Crayford window cleaners' appearance? A: You'll need to reserve a free parking space within 30 metres from your home or office and on the same side of your road. You'll also need to grant the team with unrestricted access to your property. A: Yes, our services are covered by an extensive insurance policy. Also, the pros are certified to wash windows big and small, single or double, as well as French doors, door panels and even conservatory roofs. Q: Can you wash commercial properties as well? A: We will happily wash any four-storey or multistorey commercial premises. We can also supply you with other maintenance alternatives, such as gutter cleaning and pressure washing. With window cleaning in Crayford, you'll give your glass surfaces the expert wash they deserve... at custom-tailored price rates that will stay within your budget! Don't believe us? Disperse your doubts by consulting our price table below. No matter where your smudges have taken refuge, our resourceful window cleaning in Crayford will fight them off with ease. We have included a number of cleaning methods. Our external window polish is designed for buildings with no more than four storeys. To let the sunlight back inside, the window cleaners in Crayford will appear in a van, supplied with a retractable water-fed pole. This system is attached to a water storage, filled with filtrated water. After being released as a powerful stream from the pole's brush-head add-on, the water will absorb all dust build-up in an attempt to regain its original structure. To reach dusty window corners of multistorey properties, we'll send a proven team for rope access window cleaning. These certified climbers will utilize well-maintained ropes and harnesses or deploy ladders and cherry pickers to restore the allure of your panes. We've got all important COSHH records in place and follow every safety rule and regulation. To make the interior side of your glass façade just as glossy, the experts will rely on the established ladder and squeegee washing procedure. 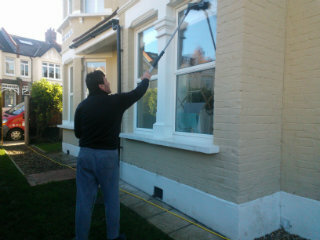 As our customer base expanded, we introduced our window cleaning in Crayford to cover other London areas as well. Please consult with our concise list to see which neighbouring locations we visit. Another quick and easy way to get a free instant quote or to book window cleaning services Crayford DA1 is through our web site.